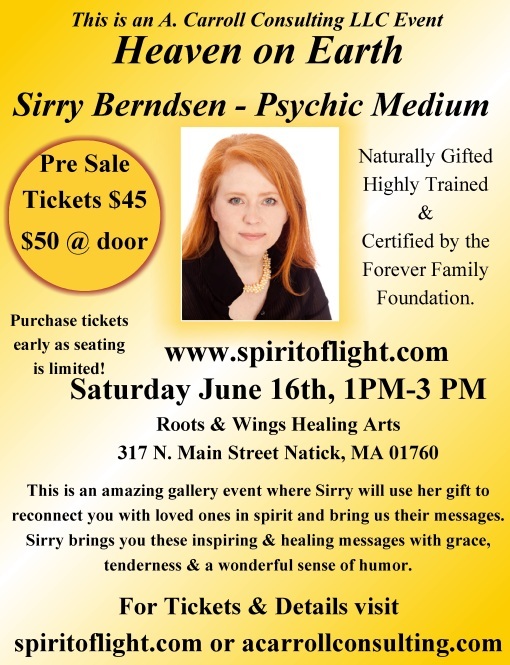 Heaven on Earth with Psychic Medium Sirry Berndsen | Roots and Wings yoga and healing arts, Natick, MA"
Certified Psychic Medium, Sirry Berndsen will use her incredible gift to communicate with those in spirit to bring us their messages. They want to talk to you just as much as you want to hear from them. This is your chance to make that connection! This is a small gallery event, 45 seats max. There will also be a Q&A at the end. Sirry was born with the ability to communicate with spirit. She has chosen to use her gift to help others heal. You will be astounded by not only how specific the information is that comes through, but also by how compassionately and when appropriate, humorously she delivers it. Sirry is a very evidential medium that has been certified by the Forever Family Foundation. She has studied with amazing teachers such as Carole Lynne, and Brenda Lawrence & even taken workshops with James Van Praagh, John Holland & Lisa Williams. Her natural gift, bright personality, and ability to truly blend with spirit has amazed audiences throughout the country. Every reading from her is a blessing. Pre-Sale Tickets $45 acarrollconsulting.com or $50 cash or credit at the door if seats remain. Purchasing tickets prior to events is highly recommended as seating is limited. Our events sell out quickly!! Tickets are non-refundable.